Browse: Home » 2010 » December » Where’s this train going? 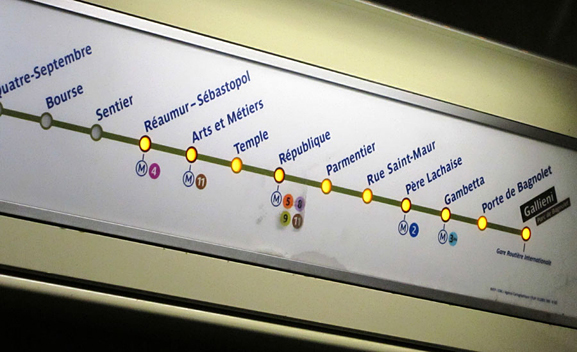 Foreign tube/metro/subway systems can be confusing. This is a really low-tech but highly-useful solution for indicating to passengers which direction the train is travelling in. The lights come on as you pass through stations. Most recently I was appreciating it on a trip to Paris, but I know it’s a system used in Barcelona too (and lots of other tube systems judging by a google search). Not London. Yet? Initially I liked this, but now I have a nagging thought about it. At first glance I’m not sure it is obvious which way the train is going. Until you’ve seen it change in relation to the view out of the window or the announcement over the tannoy at your first stop, it’s not that clear. Does a light mean the station has been visited? Or does it mean it’s yet to come? I only know thanks to your accompanying text. The light either means “We’ve been here” or “You can still get off here”. A light being illuminated for something been, gone and now irrelevant seems somehow counter intuitive. In the brevity of my description I overlooked to mention the fact that the next station to be reached flashes. Whether or not you think that would help I promise it is apparent which direction you’re going in. I guess you never view it in a static manner as displayed here. Both you and it are rattling along in the carriage together, the stations lighting up as you pass through them. Regardless, my motivation for publishing this was to act as an example of a low-tech solution, something that stands out in today’s high-tech world.